Mary Lou (Rose) Plomin, 86, died peacefully on Tuesday, January 29, 2019. Mary Lou is survived by her husband, Joseph, 7 children, Mary Jo (Tim) Corcoran, Susan (Dan) Lazarich, Joseph Jr. (Susan), Paul (Cara), Dave (Kali), Dan (Elizabeth) and Steve; 11 grandchildren, Katie, Kelly, Sarah, Tony, Rose, J.D., Jack, Indira, Karma, Erica, and Sophia; a sister, Virginia (the late Ronald); brother, Timothy (Alice), loving aunt to many nieces and nephews and many treasured friends. Mary Lou was born to the late Sterling and Virginia Rose in St. Louis, MO in December 1932. As a child, she loved to play along the North Branch of the Chicago River climbing trees and playing at Waters Park. Mary Lou graduated from Immaculata High School in 1951 and is still friends with some of her high school (and grade school) classmates. Mary Lou went on to attend Ravenswood Nursing School and graduated in 1954. One of her proudest memories was giving the graduation speech! Mary Lou and Joe were married in 1958, immediately started their family and had 7 children within 11 years. Mary Lou and Joe have been married for 60 years. Mary Lou had an innate ability to care for others. Nurse Mary Lou’s career spanned 40 years, ending when she was in her 70’s as a hospice nurse. She had an extraordinary ability for compassion and making people feel better, patients, family, friends and even strangers. Mary Lou had strong faith and was very active in the Church throughout her life. 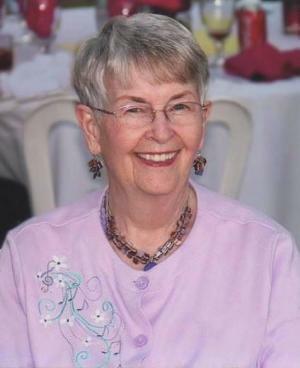 During her young adult years she was involved in groups at Queen of Angels and St. Andrews, while living in Homewood Mary Lou was quite active at St. Joseph’s a daily mass regular, serving on the Athletic Association board, Fund Raising Committees, and even taking blood pressures after mass. Mary Lou had a heart of gold and was very dedicated to family and friends, she was always planning the next party, get together or reunion. Along with never missing a party, she loved to sing, dance, paint and read. Sending thoughtful notes to people was part of her daily routine and she treasured the cards and notes she received throughout her life. Mary Lou has had such a positive impact on so many people’s lives and will be missed dearly. A memorial service will be held at Queen of All Saints, 6280 N. Sauganash Avenue, Chicago. Visitation at 9:15 a.m. until time of Mass at 10:00 a.m. Luncheon to follow. Additional information is available at www.cooneyfuneralhome.com or 847-685-1002. In lieu of flowers donations may be made to Rainbow Hospice.